Why is it whenever there's an apocalyptic race there always seem to be conveniently crumbling skyscrapers upon which to race? Not that I mind that sort of thing, but I can't help but think that over and over in my head as I watch Matt Southern, game director for Motorstorm Apocalypse, zip neatly from rooftop to rooftop in the Skyline level of his game. The Skyline map is visually rich, packed with crumbling construction, buildings toppled into one another, routes that trace along the top of and into the facade of a city, a world dying. Unlike Motorstorms before it, with Apocalypse the team decided to focus more on races than tracks. That sounds like a minimal distinction. But Southern explains that it means that the game is presented in an ever evolving landscape. Even as he tears laps around the rooftops and top floors of Skyline on a motorcycle the routes change, buildings collapse, things implode. In previous versions of the Playstation 3 exclusive if you ran multiple races on the same track the only thing that changed was how good the computer-controlled competition was. Not so in this latest Motorstorm. "Now when you revisit a race we're trying to make it as different as possible within the same track," Southern said. "So the damage that happened in previous versions is still in place." The races also occur in a world that never sits still, so as it becomes night, you race in the dark. "As the chronology progresses it gets darker and more Apocalyptic," he added. "The skies turn red, the military prescence within the city realize there's not going to be anything left to protect and they turn on Motorstorm and attack." The end result is a game with 40 different races, but not necessarily 40 different tracks. As Southern explains this he's weaving his motorcycle along the Skyline race. During the second lap around the conveniently circular rooftop track a nearby building topples into the one Southern is racing along. The impact is dramatic, both visually and how it impacts the way Southern is driving. Suddenly the relatively broad strip of rooftop he was speeding across becomes a narrow allow between piled up demolition. Southern calls that "thinning" out the course, something that happens quite a bit in the game's races. 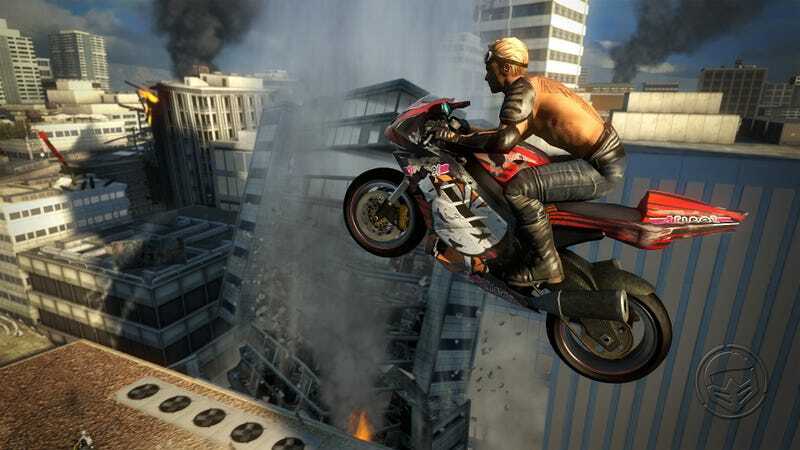 "The core DNA of Motorstorm, multiple routes, is still there," he said. "But not it changes by lap." Later Southern gives me a chance to check out the game. He flips it to 3D, handing me a pair of glasses to slide on. The 3D adds an interesting layer to the gameplay, literally. Suddenly I have a better sense of my placement in a course and of how my car fits along the line I'm trying to find in turns. Southern said the developers worked to make sure that those who play in 3D won't have an unfair advantage over those who play in 2D. "It's very subtle," he said. "We didn't want to make it an unfair advantage, but there is an advantage. It's a bit easier to judge position and depth, for instance." It can also be distracting, but in a good way. I manage to drive straight into a pile of rubble while marveling at how unbelievably real the rain looks as it hits the image floating in front of me in 3D. The water beads and traces slowly down the screen as a drive in the rain. Despite the added visual fidelity provided by the 3D graphics, I still can't imagine I'd spring for a 3D television to play this or any other game in 3D. Despite Motorstorm Apocalypse's visual achievements, no one has created a game that will sell 3D TVs yet. But I'm OK with that, and the team seems to be too. Apocalypse is still very much an impressive looking video game first, and a 3D gaming poster child second.